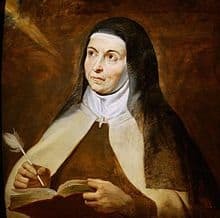 Background: St Teresa was born at Avila, Spain. Her mother died when she was 14, “Prompting her to embrace a deeper devotion to the Virgin Mary as her spiritual mother”. She entered a cloistered life with the Augustinian Nuns and then a Carmelite Monastery. She experienced numerous mystical visions and is closely associated with the venerated image of the Infant of Prague. Her Feast Day is 15th October. We thank You for, “The great gift of faith and devotion to the Holy Sacrament,” which You granted to Your beloved Teresa. We pray that, by Your merits and by those of Your faithful spouse Teresa, we will receive the gift of a lively faith and a fervent devotion towards the most Holy Sacrament of the altar; where You, O infinite Majesty, gave Yourself to be with us even to the end of the world and where You so lovingly gave Your whole Self. St Teresa, I pray (Share your request…) but may the will of God the Father Almighty be done. St. Teresa: Pray for us, that we may become worthy of the promises of Jesus Christ. and draw from it the fervour of a tender devotion. We thank You for, “The great gift of hope,” which You granted to Your beloved Teresa. We pray that by Your merits and by those of Your holy spouse, we will receive great confidence in Your goodness, by reason of Your Precious Blood, which You shed to its last drop for our salvation. We thank You for, “The great gift of love,” which You granted to Your beloved Teresa. We pray that, by Your merits and by those of Your most loving spouse Teresa, we will receive the great crowning gift of Your perfect love. We thank You for, “The gift of great desire and resolution,” which You granted to Your beloved Teresa so that we might love You perfectly. We pray that, by Your merits and by those of Your most generous spouse Teresa, we will receive a true desire and resolution to please only You, the utmost of powers. We thank You for, “The great gift of humility,” which You granted to Your beloved Teresa. We pray that, by Your merits and by those of Your most humble spouse Teresa, we will receive the grace and joy of true humility. We thank You for, “The gift of devotion towards Your sweet mother Mary and her holy spouse Joseph,” which You granted to Your beloved Teresa. We pray that, by Your merits and by those of Your most dear spouse Teresa, we will receive the grace of a special and tender devotion towards Your most holy mother Mary and towards Your beloved foster-father, Joseph. We thank You for, “The wonderful gift of the wound in the heart,” which You granted to Your beloved Teresa. We pray that, by Your merits and by those of Your beautiful spouse Teresa, we will also receive a wound of love so that, henceforth, we may love You and give our mind to the love of nothing but You. We thank You for, “The eminent gift of the desire for death,” which You granted to Your beloved Teresa. We pray that, by Your merits and by those of Your most constant spouse Teresa, we will receive the grace of accepting death, in order to go and meet You for eternity in the country of the Blessed. We thank You for, “The gift of the precious loving death’ which You granted to Your beloved Teresa. We pray that, by Your merits and by those of Your most affectionate spouse Teresa, we will die a good death with a burning of love for You and, love You for ever more with a perfect love in heaven.